Stephen and Anne's life in pink: Where did you get that hat? Sainsburys. ThingOne's been on really good form for a week now, having got over some illnesses. Parenting seems so easy when she's well. Tiring, but such a pleasure. She's toddling around being very funny and has recently started wanting to kiss us quite a lot (but only on her terms - it doesn't work if YOU want a kiss.) This is lovely, unless she hasn't has her nose wiped in a while, in which case it's quite grim. Even on top form ThingOne's still willful. 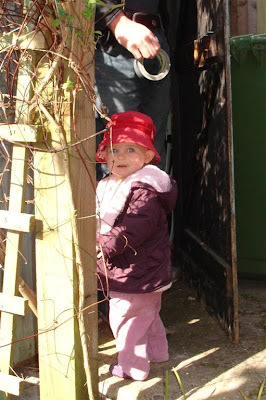 I bought her a hat for the summer on Friday from Sainsburys (yes, my daughter is almost as trendy as I am). It's a nice red hat but ThingOne refused to wear it. She delighted in pulling it off her head as soon as we put it on her and throwing it to the ground. Today though we may have found the solution. 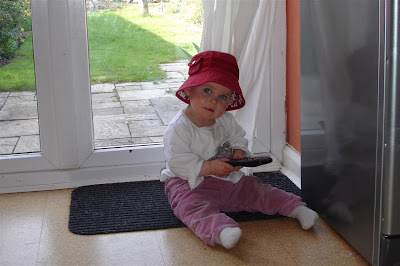 I showed her pictures of a baby wearing a red hat in one of her books, and put ThingOne's hat on one of her dolls. I pretended that I thought the doll looked rather dapper wearing the red hat. The next time I put the hat on ThingOne's head, Anne and I clapped for ThingOne, and ThingOne looked very pleased with herself, as though it was she and not me who had had a victory here. She then kept it on for quite a while. 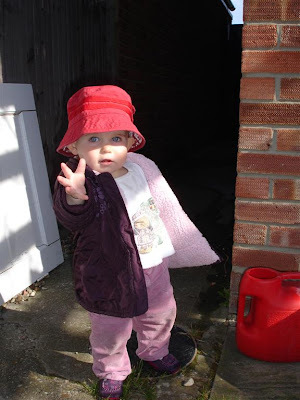 When I later stopped her from walking into the road outside our house she became enraged and threw the hat to the ground, so the victory ended there, but it was a victory all the same.